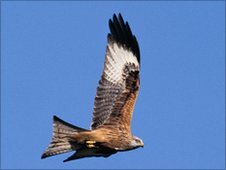 It is now 11 years since the process of reintroducing Red Kites into Yorkshire began at Harewood in 1999. The birds are being seen on an increasingly regular and widespread basis, even in urban Leeds, a sure sign that the programme has been successful. Red Kites are large birds with a distinctive forked tail. The project officer Doug Simpson said: "The programme got off to a cracking start with successful breeding in the first 12 months and never looked back." Doug has been involved since the start of the release at Harewood when 69 young birds were released between 1999 and 2003. The Yorkshire Project is the only one of the release projects to have had successful breeding in its first year. The project has gone on from that great start to re-introduce red kites to a wide area of the county. From north of Harrogate to Wakefield kites are to be seen in the skies. And a new population of eight or nine breeding pairs has even spread right to the Yorkshire Wolds from Harewood. "That colony separated by around 30 miles is a totally unplanned bonus. "It's very pleasing that people are beginning to see the birds even over Leeds city centre. They are already regularly seen over Chapel Allerton, Harehills and Roundhay for instance. "How far an individual bird will go looking for food is a bit of an unknown quantity. It will go as far as it needs to find food. "It seems that older birds know the best places to look for food." Doug admits that a few people might not welcome the red kites as much as he does but it is not an exotic species as red kites became extinct in England and Scotland around 150 to 200 years ago. 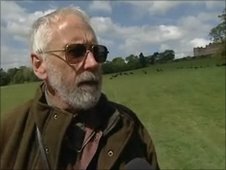 The Harewood Red Kite Project is one of 11 in the UK reintroducing it. The bird's major predator is man. "First there is the totally illegal poisoning of bait, this is indiscriminate and might be supposed to keep the crow or fox population down but we have lost 20 kites - that we know of - to illegal poison. "We also lose birds to the consequences of legal poisoning when they eat dead rats that have been poisoned." The project is a time consuming one for Doug especially during the breeding season. Our recent cold winters are taking a toll too. "The hard spell of weather is concerning me, we have had casualties last winter and I am on tenterhooks that we don't have greater numbers this winter." Keep your eyes peeled because sightings of birds seen regularly frequenting a particular area are useful to monitor the progress of this expanding population.